No, it’s not a pet hamster. New for 2019, Industry Nine introduces Hydra, a project over two and a half years in the making. Since the success of the company’s lightning-quick 3-degree engagement Torch Series hub introduced in 2013, i9 continues to advance forward in re-defining what is capable. 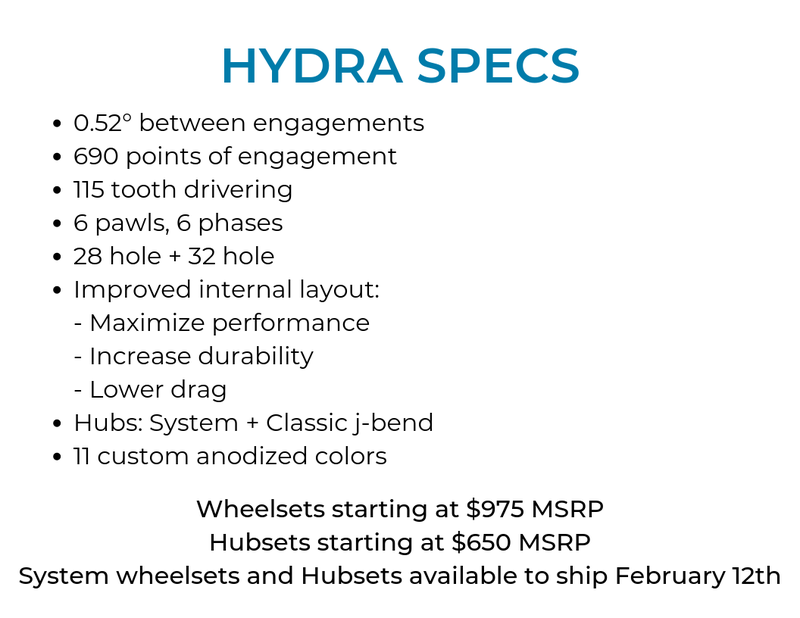 Hydra offers a monstrous 690 points of engagement (POE) or 0.52-degrees between each engagement and a new 115-tooth drivering with a six pawl system. Industry Nine states that the innovating new design utilizes a continually phased system, creating a procession of engagement points between pawl and drive-ring. The design utilizes the inherent flex of the axle to accomplish positive second, third or fourth pawl contact. Hydra also tempers uncontrolled axle and bearing movements conventional designs can’t mechanically limit, thus improving bearing life and decreasing resistance. Hydra is consistent, reliable engagement without overloaded bearings, axles or hub shells. We were able to get our hands on the new Hydra Series hub pre-release and to say the least, we are smitten. Swapping back and forth between a Torch Series hub and the new Hydra Series hub had a similar effect of what it feels like when you swap between an Industry Nine Torch hub and an 18-tooth star-ratchet hub. While the Hydra and Torch buzz is similar, the engagement of the new Hydra Series is unmistakable. Industry Nine also claims there is a decrease in drag with Hydra when compared to the Torch Series. After multiple rides focusing especially on the perceived amount of drag, I was not able to clearly determine one way or the other. Which still seems like a win in my book given that the engagement went from 120 POE in the Torch to 690 POE in the Hydra. The new design is also said to increase the durability of the bearings which we are putting to the test in a long-term review. Be sure to subscribe to Dirt Rag Magazine and keep your eyeballs peeled on our website in the coming months as we put the new Industry Nine Hydra hub through a full range of weather conditions here in the Northeast. Industry Nine also is releasing high engagement hubs in an innovative and affordable package, the 101 Series hub. The 101 hub features a dual phased-pawl drive mechanism accomplishing 90 points of engagement and 4-degrees of engagement by way of six pawl driver and 45 tooth drivering. The 101 Series stays true to the company’s performance heritage and takes a no-nonsense approach in welcoming more riders to the Industry Nine brand. 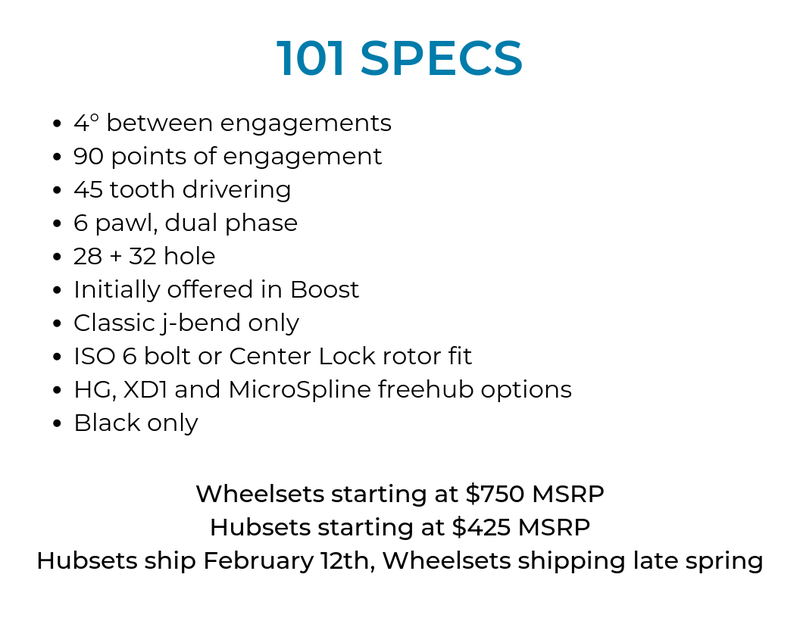 The 101 Series will be initially offered as standalone Boost mountain hubsets in 28 or 32 hole options, ISO 6-bolt or Center Lock rotor fit, and HG, XD1 or Micro Spline freehub body options. No fancy anodized color options here though, black only. Complete wheels will be available late spring.